Oh, you knew it had to happen someday… it was fairly inevitable that I’d have to quote the ultimate fantasy gamer geek movie of all time and relate it to D&D 4e. Although there have been other movies come along since then, I’m almost certain that no movie has ever been quoted more often around a Dungeons & Dragons gaming table as Monty Python and the Holy Grail! FATHER: No, not the curtains, lad. All that you can see! Stretched out over the hills and valleys of this land! This’ll be your kingdom, lad! FATHER: Listen, lad. I’ve built this kingdom up from nothing. When I started here, all there was was swamp. All the kings said I was daft to build a castle in a swamp, but I built it all the same, just to show ‘em. It sank into the swamp. So, I built a second one. That sank into the swamp. So I built a third one. That burned down, fell over, then sank into the swamp. But the fourth one stayed up. An’ that’s what your gonna get, lad – the strongest castle in these islands. Designing and mapping out a campaign world is one of the more tedious tasks that a Dungeon Master faces. Deciding the nature of a kingdom or country, its cities, currency, and terrain is cumbersome, and having to do that over and over again, across an entire world can be downright daunting. Even when dealing with the pre-existing campaign settings available on the market, there are often vast portions of the world that are under-developed, with wide open wildernesses or with populated areas that are poorly defined, and need additional work to make them “player-ready”. Usually, this is not an immediate problem, but it can certainly become one in a hurry. For what happens if your adventurers decide to start journeying through unchartered lands on the way to the next adventure? But over at Chaotic Shiny Productions, they’ve developed an application to take the tedium out of world-building: the Kingdom Builder Generator Pack. 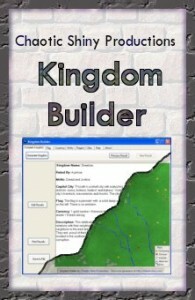 Kingdom Builder Generator Pack is a set of random generators, capable of creating a fantasy or science-fiction based “kingdom” in seconds. 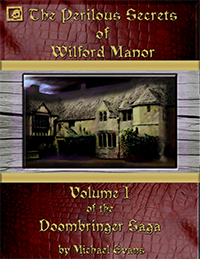 It is generically designed to be used with D&D 4e, as well as just about any other game system one could imagine. It contains random generators for creating mottos, flag descriptions, and currency systems (including the names and denominations of coins), that can be used for city-states, countries, or whole empires. Short, but detailed descriptions of individual cities, whole regions, and even an entire kingdom can be randomly generated in moments, to be used as the starting concept of a geographical glossary. There is even a random mapping tool to generate a basic area map, showing civilized areas, danger zones, points of interest, and general geographical information. The production quality of the Kingdom Builder Generator Pack is very good overall, although the mapping tool generates only the simplest of maps. The interface is straightforward and intuitive, and there are numerous “help dialogues” to explain how various buttons and drop-downs function. The Kingdom Builder Generator Pack is actually a composite of six random generators, with a seventh Complete Kingdom generator, utilizing several different generators at once, to create a whole “national concept”. Some of random generators, such as the Flag, Currency, Motto, and Region, are available from the Chaotic Shiny website for free. But the Complete Kingdom, Cities, and Map random generators are completely new applications for use in this program. As I mentioned, some of the random generators are available at the Chaotic Shiny website. But even these “free” generators have been enhanced considerably from their web-based applications when they were added to this program. These updated generators in the Kingdom Builder Generator Pack can produce more than twice the number of random results (up to 50 at a time) in mere moments, and the output can be saved to file, printed, and even edited within the program. Even the previous results can be quickly accessed, so that there is little chance of losing a concept. The flag is a rectangle with two stripes of sea green and dark yellow, and a diagonal bar of blue-black from left to right. The emblem is a doorway and a sword represented in a very stylized way. The flag is a gonfalon (banner) with two stripes of azure and dark yellow. The emblem is a fiddle and a stag. The flag is a rectangle with a solid dark yellow background. The emblem is an arrow and axes represented in a very stylized way. This large region’s people follow mostly one religion. They are proud of their local music. There are no major cities. The largest town is located in the southeast of the region. They are sometimes troubled by religious strife. They are bordered on two sides by grasslands and on two side by rivers. Their relations with their neighbors to the southwest are stable, while relations with neighbors to the north are strained. They adore their political leaders. This large region is mocked for their local attitude. They frequently rebel against their political leaders. There are four major cities, the largest of which is located in the southwest of the region. They are bordered on two sides by forest. Their relations with their neighbors to the northwest are friendly, while relations with neighbors to the north are strained. They are currently troubled by piracy. This small region’s people are proud of their political leaders. They are bordered on three sides by mountains. Their relations with their neighbors to the northwest are turbulent, while relations with neighbors to the north are strained. There are four major cities, the largest of which is located in the north of the region. They are often troubled by problems with law enforcement. The people follow mostly one religion. They are proud of their local art. The output for the Currency generator is quite flexible, capable of considerable modification, with options for creating ancient or futuristic coinage, and a selection for creating coin names only or names and values. And the Region generator creates some really interesting concepts for an area, pulling in social, political and economic issues to add to a general geographical description. This is obviously very useful when world-building, juxtaposing a variety of factors in ways that a Dungeon Master might not normally consider. Rashav is a mid-sized city with a powerful military. Its people take pride in their wild parties, clerics and paladins. There are three major districts: slums, academic and pleasure. The city guards are laughable. Drav is a relatively small city with more than a few taverns. The city guards are cheerful. Visitors should be on the lookout for the city’s wonders, skilled animal trainers, wizards, mercenaries, quality alcohol and race tracks. Aelundrra is a somewhat small city with many mysteries. The city guards are known to enjoy pastries. It is known for its enchanters, fashion and druids. Capitol City: Shaellenri is a tiny city with quiet streets. It is known for its taverns, race tracks and lavish temples. The city guards are easily bribed. Flag: The flag is a rectangle with eleven vertical stripes of alternating dark red, dark red-violet and dark bronze. The emblem is a fish scale. Description: This somewhat small kingdom’s relations with their neighbors to the north are stable. They are bordered on two sides by grasslands and on two side by rivers. They are mocked for their local wildlife. There are four major cities, the largest of which is located in the southeast of the kingdom. The people have no particular religion. They are sometimes troubled by problems with trade. 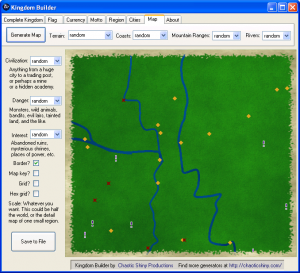 Given that you can randomly generate up to 50 city concepts at a time, and a different kingdom as quickly as you can press a button, the possibilities for world-building are enormous, allowing a Dungeon Master to rapidly create basic descriptions of whole nations (kingdoms), districts and provinces (regions), and population centers (cities) in almost no time at all. Regrettably, the Map application is probably the weakest tool in the Kingdom Builder Generator Pack “toolbox”, randomly generating only a very simple map design. 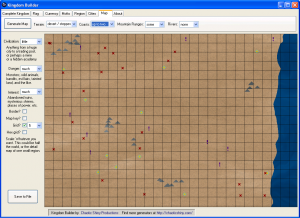 But even though the actual map “graphics” are simple, the generator does have its uses. The terrain type, the number of coasts, and the frequency of certain elements such as mountain ranges, rivers, civilized areas, and danger zones can all be modified before a map is created. This allows the DM to have a great deal of control over the type of region being mapped. The scale of the maps is completely at the whim of the user, and hex or square grids can be added at whatever size is appropriate for the game. So the tool is not without some merit to Dungeon Masters that are not comfortable with massive drawing projects, or who wish to create a quick regional or continental map “on the fly”. Even advanced map-makers can find some inspiration in the Map application, utilizing the random distribution of civilization, danger areas, and points of interest to add to areas they have not yet developed. Overall, the Kingdom Builder Generator Pack is a very nifty tool for any Dungeon Master’s computer, and of particular use to and DM trying to break into world-building. Even for those campaigns using pre-packaged “official” settings, the Kingdom Builder Generator Pack can offer the ability to develop nations or even whole continents not detailed by the original authors, allowing for greater exploration possibilities by Player-Characters. And given the addition of new planes such as the Feywild and the Shadowfell, there are vast stretches of “official” campaign settings that remain un-mapped and uncharted, and for the most part only vaguely designed. Although the official price has not been set yet, I have it on authority of “Swordgleam” that the Kingdom Builder Generator Pack would retail for “around $4”, which makes it a lot of software for only a little cash. Editor’s Note: This Blog’s Author received a complimentary copy of the software application from which the review was written. This entry was posted by Editor-in-Chief on Monday, February 15th, 2010 at 7:50 am	and is filed under RPG News & Reviews. You can follow any responses to this entry through the RSS 2.0 feed. You can leave a response, or trackback from your own site. You mention that the map builder is very simple. If/when I update the Kingdom Builder, or if I release another map application, what sort of features would you like to see added? Well as I was using it, there are a few terrain types I thought might be good additions – I’d recommend random forests in the temperate areas; where a river and a forest meet, you could randomly determine if it is a swamp; for desert area, rather than rivers, add canyons; arctic areas could also have trees, albeit pines, as well as glaciers; you could also add the possibility of ponds/lakes to arctic and temperate (green) areas, which could be the source of a river system. I’d say the biggest thing I noticed missing in the map was the forests. Nothing spruces up the place like some plants!